A surf and turf plate was prepared by Ipswich Clambakes. The classic New England clambake is alive and well — and gluten-free upon request. The traditional meal features steamed clams and lobster with drawn butter, plus sides including corn on the cob. It is served on a platter in many area seafood restaurants. But the best way to enjoy a clambake is outdoors at water’s edge, with sand or at least grass underfoot, sun in your face, and a salt breeze. For most people these days, that means a catered event. “Their main goal is to have a casual party that’s a New England tradition and have a lot of fun, but no work for the host. That’s what we get the most,” said Wendy Viator, sales office manager at Woodman’s of Essex, the landmark restaurant billed as the birthplace of the fried clam. Woodman’s caters perhaps 400 events a year, said Viator, who is the first-born of the fourth generation of the Woodman family. A few years ago, Woodman’s added mobile deep-frying equipment, and it now offers fried clams and other items in addition to steamers and lobster. Conversations with caterers reveal that the clambake still rules on the North Shore and beyond, but with a few variations to reflect America’s changing palate. Family reunions, weddings, and corporate events are the mainstays of the clambake business, whether staged on a private beach, a backyard, or a rented facility, such as Steep Hill Beach at the Crane Estate in Ipswich. When it comes to food, the first thing to remember is: “People call it a clambake, but the prime [attraction] is the lobster,” said Jason Bromberg, one of the owners of Stoneham-based Clambake Charlie’s catering. With out-of-town diners, “There’s a lot of telling people how to do it, how to eat a lobster, but usually if there’s a bunch of people at the table, somebody knows how and tells them,” Bromberg said. “What better way to share New England with them?” said Keith Woodman, another fourth-generation family member who is now co-owner of the Ipswich Clambake catering business and restaurant, with a second location just opened in Manchester, N.H.
For some, clam chowder is an essential part of a clambake. Others favor mussels with or in place of the steamers. Most bakes with more than a few guests will have hot dogs on the grill for those who are not shellfish eaters. And for many, strawberry shortcake is the essential dessert. In some cases, the menu has been upscaled for a new generation. Ipswich Clambake has also purchased an old fire truck converted into a food truck, which will allow it to add wood-grilled pizzas and soft-serve ice cream to its clambake menus, Keith Woodman said. Americans also have a lot more dietary restrictions these days. “Gluten[-free] is probably the biggest thing that has changed, that people ask for. But most things on our menu are gluten-free,” said Viator, with corn flour used for deep frying. The classic old-fashioned clambake generally took place on the beach, in a kettle filled with seaweed over a driftwood fire. But caterers these days use water in the kettles over propane burners. Because of permitting limits, except for a few private beaches, the cooking and often the eating is done near the water but not actually on the sand. It is difficult to nail down apples-to-apples price comparisons between caterers, as their rates vary widely based on number of guests, menus, and other amenities provided, such as tables and chairs. A very broad rule of thumb seems to be $40 per person for a traditional clambake served on site for a moderate-sized party. The clambake is traditionally a summer activity, but the end of the season now extends beyond Labor Day, most caterers said. Woodman’s has known that for a while. Essex River Cruises & Charters offers clambakes on a tidal beach in Essex Bay — with diners cruising out and back on the Essex River — for up to 55 people, said crew member Powers Hommel. Volleyball and beach toys are also part of the four-hour event. Newburyport’s Starboard Galley restaurant does a lot of catering, but only about 10 percent of events opt for the clambake now as opposed to steaks and other items, said catering manager David Greco. Price might have become an issue over the years, Greco said, but the restaurant still does a good business with evening cruise clambakes on the Merrimack River around Newburyport on boats from the Captain’s Lady fleet, he said. 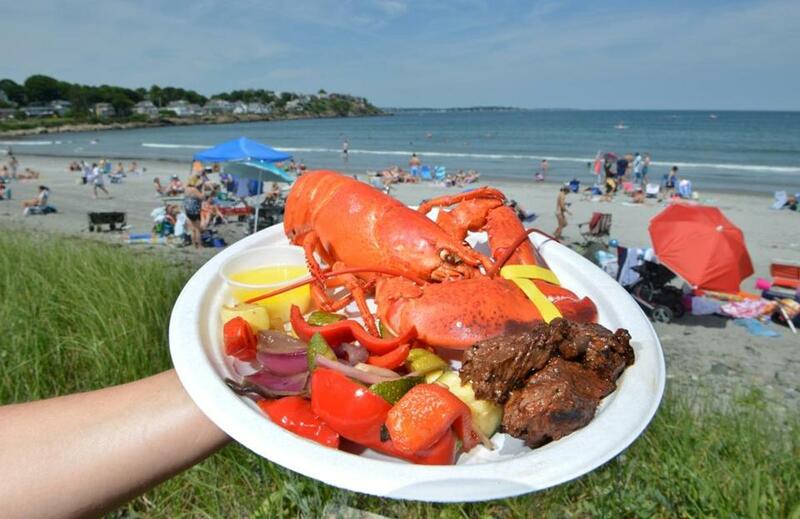 Perhaps the most exciting event on the Starboard calendar this summer is serving clambake fare for 750 at Plum Island Point as one of the businesses involved in Newburyport’s 250th anniversary celebration, a ticketed event in August.